The Le Casino cinema in the French town of Albert—rue Jeanne d’Harcourt—reopened its doors to the public on 8 October. This emblematic city venue was remodelled by Atelier Architecture Lalo, a Parisian studio focused on the design and transformation of existing spaces. 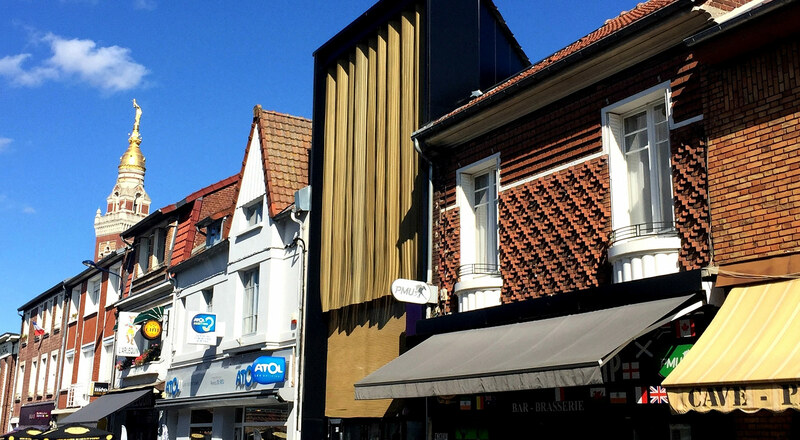 Codina was the company chosen to provide the distinctive touch to this renovation project, with the manufacture of the two huge gold metal mesh curtains that now adorn the cinema facade. The upper curtain, made using 6 metres of metallic Paxton-model mesh, was designed to emulate a curtain effect to add eye-catching appeal to this city-centre building. The straight lines and static form of the Mies mesh used in the lower curtain emphasise the movement of the upper layer. Both are formed from gold-finish aluminium. The project, which cost €2.5 million, features two screening rooms, one to be used for cinematic and performing arts productions and the other as an auditorium for public events and represents an opportunity to enhance and strengthen activity in the city centre, as well as acting as a symbol promoting freedom of expression and the values of the French Republic.